If you're searching for a casual yet stylish ensemble, pair a Dondup turtleneck knit sweater with black ripped skinny jeans. Both garments are totally comfy and will look fabulous paired together. Kick up the cool of your look by complementing it with dark brown nubuck ankle boots. If you're on the lookout for a casual yet totally stylish look, go for a grey knit turtleneck and a black skater skirt. Both items are totally comfy and will look fabulous together. Take a classic approach with the footwear and make black cutout leather ankle boots your footwear choice. If you're on the hunt for a casual yet stylish look, dress in a grey knit turtleneck and black tapered pants. Both garments are totally comfy and will look fabulous together. Break up your ensemble with more casual shoes, like this pair of black slip-on sneakers. 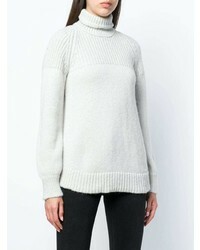 If you're a fan of relaxed dressing when it comes to your personal style, you'll love this stylish combo of a Dondup turtleneck knit sweater from farfetch.com and charcoal fair isle leggings. When it comes to footwear, this ensemble is round off nicely with beige suede desert boots. For a knockout-meets-chic ensemble, try teaming a Dondup turtleneck knit sweater from farfetch.com with a burgundy pencil skirt — these items the place of work perfectly well together. When it comes to shoes, this outfit is finished off brilliantly with burgundy suede pumps. If you're in search of a casual yet stylish outfit, try teaming a Dondup turtleneck knit sweater from farfetch.com with a black skater skirt. Both garments are totally comfy and will look fabulous paired together. For something more on the daring side to finish off this ensemble, choose a pair of black leather lace-up flat boots. 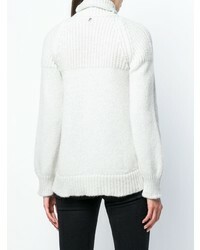 If you're scouting for a casual yet chic look, make a Dondup turtleneck knit sweater from farfetch.com and black leggings your outfit choice. Both garments are totally comfy and will look fabulous paired together. Choose a pair of black leather over the knee boots to take things up a notch. If you're on the hunt for a casual yet stylish getup, make a Dondup turtleneck knit sweater and charcoal jeans your outfit choice. Both garments are totally comfy and will look fabulous paired together. To bring out the fun side of you, complete your getup with black leather chelsea boots. 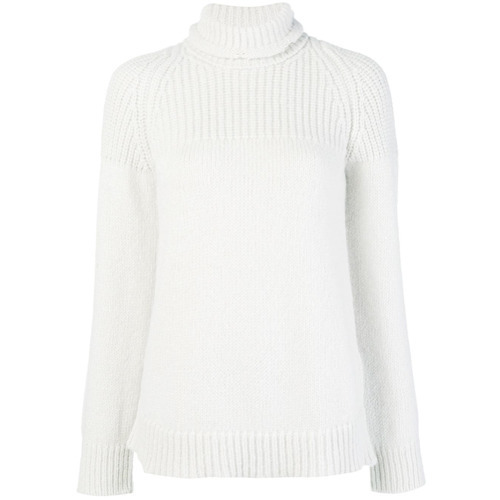 If you're after a casual yet absolutely chic getup, pair a Dondup turtleneck knit sweater with white skinny pants. Both garments are totally comfy and will look fabulous together. Black leather loafers complement this look quite nicely.